I hope everyone is doing ok as I hear winter is being rather harsh for you all! These last few weeks have been very busy and highly entertaining. It started when we were in Renfrew County, staying in a little town called Cobden. While we were staying up there, the club took us paint balling, white water rafting, zip lining and aerial obstacle course high in the trees. They were all great fun, but the one that stands out the most is white water rafting. One Saturday, 21 people (delegates & Canadians) go to white water village to go rafting on the Ottawa River. We filled two big rafts, the trip down the river and rapids took just over 3 hours going approximately 5 kilometres in distances. The guide we had made for quite a lot of fun and was the owner of the business, so had a very good knowledge of the river and surroundings, providing a good guided tour. The tour was great fun, the first 3 rapids were rather easy, no one came out of the raft luckily, but after each rapid our guide made us jump out and swim for fun and also to experience the current of the river. It was the last two rapids of the day where things got interesting, there were to large rapids in a very short distance. The second rapid being the second largest rapid in North America. My boat was the first to go over the rapid, our guides instruction before going over the rapid was " If you come out, swim as hard as you can to the right and don't look back, just keep swimming". So with that being said we pushed off the rocks and paddled or hearts down into the rapid, legs locked as hard as you can get them into the seats so you don't go flying out when you hit the first bit of turbulent water. That's where our problems started, our raft got spun 90 degrees to the direction we needed to face and our boat got flipped over as quick as blinking. I am lucky I am a strong swimmer as I managed to ride out the last few ups and downs in the rapid and swim out of the current to the shore about 45 second after coming out of the raft. Some weren't so lucky, most people were picked up by the rescue jet boats that were floating at the bottom of the rapid. The unlucky people ended up going over the next bit of turbulent water and picked up about 100 meters away from where we were flipped. One of those unlucky people was our good friend " Mike Sproxton" who was struck by the boat when it first flipped , dislocating his shoulder again. We had only been talking on the bus to rafting about his shoulder, so Mike thinks I jinxed him. Then the following week, we went to my hosts cottage on Jacks Lake. 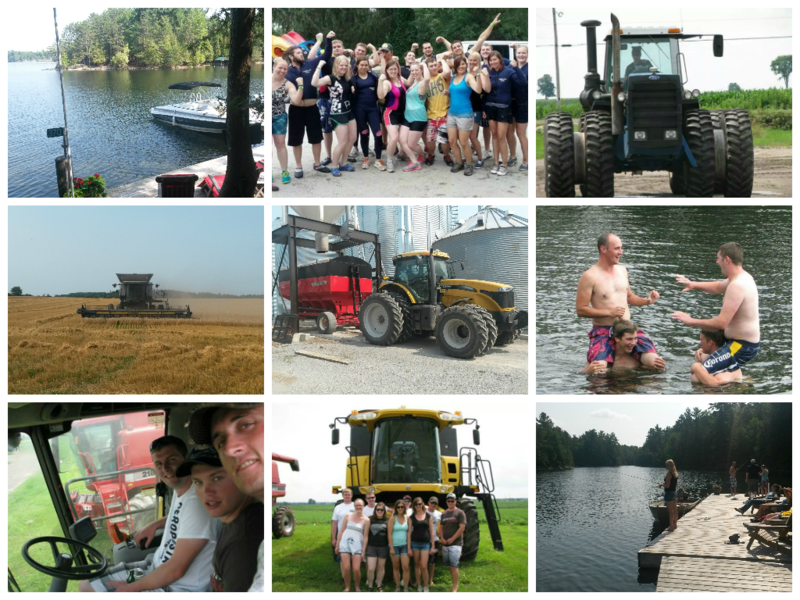 We spent three days at the cottage, where we went ski biscuiting, water skiing, wake boarding and knee boarding. When we weren't busy with the water sports we were out fishing for bass (we had our own little fishing competition going) or relaxing on the deck playing cards. One of the evenings there were about 25 of us swimming around the bay talking to the neighbour's and singing all kinds of ludicrous songs. We played gladiators on the pontoon in the middle of the bay, providing great entertainment for everyone in the bay. This week marked the start of wheat harvest for most farmers where I am currently staying (Woodville). I had the opportunity to spend a day helping with the harvest. I got to drive both the combine and the grain wagon, driving the roads (the wrong side of the road) hauling wheat from the field to the grain elevator for drying and storage. It was quite an educational and enjoyable time helping harvest approximately 150 acres of wheat. We only have another two weeks left on the exchange, finishing off our exchange is the Ambassadors banquet. I think all of us exchangees are not looking forward to our trip coming to an end. It has been one of greatest experiences of my life, the friendships we have formed over the past 12 weeks will never be forgotten. I strongly urge anyone thinking of exchange to go for it, you will never regret it. This is where I say fare well, till I see you again, bye for now.